Harvard Common Press, 9781558328617, 588pp. Fall in love with your slow cooker all over again. You probably own a slow cooker - 80 percent of American households do. For more than thirty years, its unbeatable convenience and practicality have made it a staple of busy families, enabling anyone to return to a home-cooked meal at the end of a hectic day. 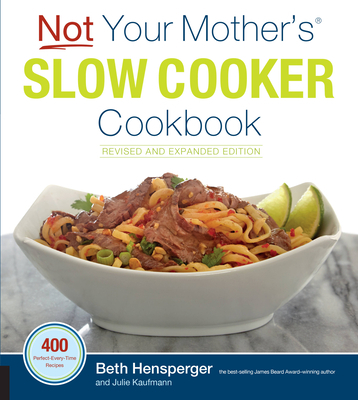 Beth Hensperger and Julie Kaufmann turned slow cooker recipes on their head with Not Your Mother's(R) Slow Cooker Cookbook, making it one of the best-selling slow cooker cookbooks of all time. Now, they're going global with this revised and updated edition that includes 50 new recipes from a variety of cuisines (Greek, Spanish, Thai, Chinese, Indian, Mexican, Middle Eastern, and more) plus an exciting new collection of ways to use any slow cooker to make pulled pork and other bbq-flavored dishes. All your favorite, classic slow cooker recipes are still here, plus many more from international cuisines that bring flavor and adventure to any meal. There is also practical information on the different types of slow cookers, their latest accessories, and what sizes are best for what purposes. With over 350 recipes, this is the go-to guide for every home. Julie Kaufmann, a native of Albuquerque, New Mexico, has lived in California since 1979. She is an editor of the food section of the San JosÃ© Mercury News. Before becoming a food editor, she wrote â? ?Kids in the Kitchen,â? a twice-monthly food column for kids, also for the San JosÃ© Mercury News. She previously worked on West, which was the Sunday magazine for the San JosÃ© Mercury News, and spent a decade on the paper's business section. In addition to her work at the San JosÃ© Mercury News, Kaufmann has taught editing in the Communications Department at Santa Clara University, in Santa Clara, California. Until recently she co-wrote a monthly mystery novel review with her husband for the San JosÃ© Mercury News. She is an avid home cook who has coauthored several books with Beth Hensperger. Kaufmann lives in Palo Alto, California, with her husband and two children. Web: NotYourMothersCookbooks.com; Facebook presence.